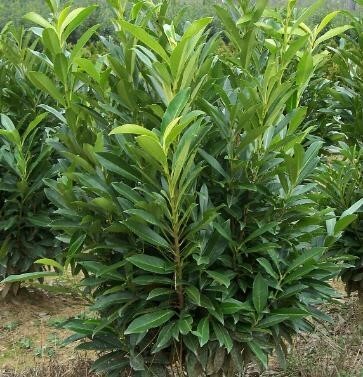 Prunus laurocerasus is a widely cultivated ornamental plant, used for planting in gardens and parks in temperate regions worldwide. 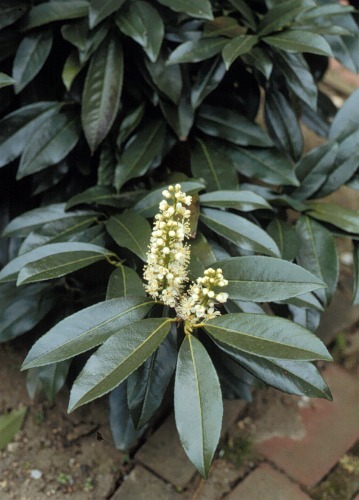 It is often used for hedges, as a screening plant, and as a massed landscape plant. Most cultivars are tough shrubs that can cope with difficult growing conditions, including shaded and dry conditions, and which respond well to pruning. The flower buds appear in early spring and open in early summer. They have five creamy-white petals and numerous yellowish stamens with a sweet smell. The fruit is a small cherry 1–2 cm broad, turning black when ripe in early autumn. They should be pruned in the spring by selectively cutting main branches.